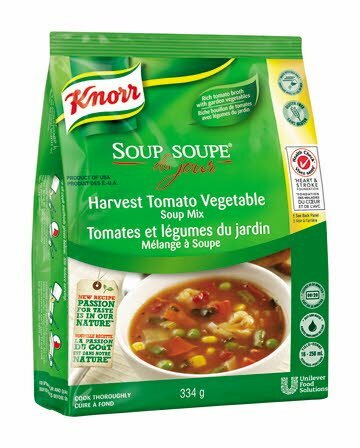 Classic tomato broth based vegetable soup, packed with large tender vegetable pieces. Vegetarian. Delicious flavour and just 480mg of sodium per 8 oz serving. DIRECTIONS NOTE: Product MUST reach a minimum of 82°C (180°F) measured with a thermometerfor 2 minutes by all cook methods given below. Stir before serving.KETTLE COOKER / STEAM TABLE: Gradually whisk contents of package in 4 litres water. Cover container. Set unit on HIGH and cook for 60 minutes. See NOTE above.STOVE TOP: In a suitable container, gradually whisk contents in 4 litres of water. Bring to a boil. Cover and simmer for 20 minutes. Stir occasionally. See NOTE above.CONVECTION OVEN: In a suitable container, gradually whisk contents in 4 litres of water. Cover container. Set oven temperature to 176°C (350°F) and cook for 30 minutes. See NOTE above. Great as a main dish entree or as an accompaniment to a salad or sandwich. Customize with leftover protein if desired such as chicken, shrimp, etc.